The Public Information Committee (PIC) is the outreach arm of the Society, promoting science outreach as a core value of ASCB and its members. It organizes science communication and public engagement activities and develops tools and opportunities for all ASCB members to improve their science outreach skills. The committee is creating evidence-based science communication resources for diverse public audiences on How to Speak about Science, Creating Opportunities for Outreach, Difficult Topics, Videos/Multimedia, and Social Media. Committee membership is open to regular members, postdocs, and graduate students. Full members serve three-year terms renewable one time. New members serve one year as Associate members before being considered as full members. Committee members are expected to participate and be engaged in committee activities and have a genuine interest in the mission of the committee. 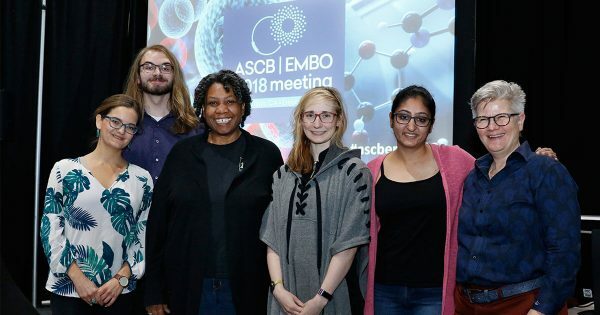 Members participate in one all-committee spring conference call and one meeting held during the ASCB/EMBO Meeting. In addition to the meetings and calls, members should be prepared to commit at least an hour each month to committee duties, sometimes more if involved with working groups or other committee activities. ASCB members interested in being considered for membership should submit a CV and a statement of interest that includes experience that relates to the committee mission. Applications are considered in the fall. Questions about committee membership? Send an email to ascbinfo@ascb.org.